Considering how much time you spend indoors, having clean air ducts is vital to the health of you and your family. 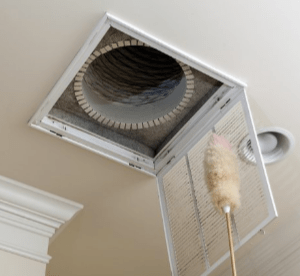 To make sure the quality of the air you breathe inside is as high as possible, it’s best to hire a professional to do your air duct cleaning. Dust: One of the most common things that collects in your air ducts is dust. Loose hair strands, dead skin flakes, cobwebs, and other materials can find their way into your ducts, and without regular air duct cleaning, they will cause clogs and decrease the airflow. Rodent Droppings: In addition to dust, you might also find rodent droppings and dead insects in your air ducts. These should be cleaned out to prevent the spread of disease. Allergens: If you find yourself sneezing or coughing more than usual and you don’t suspect it’s a cold, you could have a buildup of allergens, such as pollen or pet dander, in your ducts. Regular air duct cleaning will reduce allergens and keep the associated physical symptoms at bay. Mold: Arguably, the most dangerous thing to be hiding out in your air ducts is mold. Though uncommon, it’s still important to know how to spot mold in your ducts. Sometimes you can see or smell mold, while other times, you may only notice water or moisture inside the ducts. Regular air duct cleaning will keep your home free of this dangerous toxin. Previous Previous post: Springtime Indoor Air Tips! Next Next post: Pet Hair: What is the effect on my Indoor Air Quality?